"Give your kids a vision even if it is the wrong one," said James Dean at the Mazza Museum Summer Conference 2013. His father had a vision that he would one day become a concert pianist, but Dean didn't like the piano lessons. 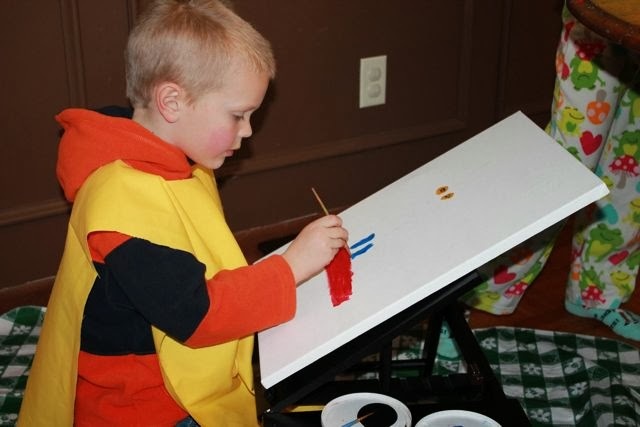 I have a vision that all my children will grow up to be artists. As a father with a vision for his children, I felt comforted, reassured and encouraged as I wrote down those words in my journal that day. For Dean he may not be pleasing thousands through piano music, but he fulfilled his father's vision in his own way by influencing millions through his artwork and children's books. My kids may not grow up to be artists but I believe Dean is right. 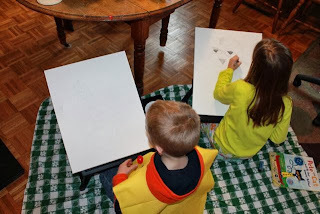 My vision for my children will likely instill the confidence they will need to be successful in whatever creative profession they choose. James Dean is the creator of the Pete the Cat series of picture books and beginning readers. His road to publication is an inspiring story. He went to college to become an engineer and worked at a co-op with Georgia Power Company to get through school. Dean drew and sketched between classes and found himself admiring the art students around campus. He even took an art class during his last year of school, but after graduating and getting a job with Georgia Power he quit drawing for ten years! He said, "I thought I would go to art school when I retired." (Mazza Keynote). Around the age of 35, he joined an artist co-op which allowed him to paint and then show his work. When he had success selling some of his artwork he wondered if he could quit his job and become a full-time painter. That is exactly what he did! According to Access Atlanta, Dean began his new career as an artist sketching "old buildings, classic cars, and Atlanta city landscapes." Then, one day he painted his cat Pete and sold about 15 original paintings of him (Mazza). 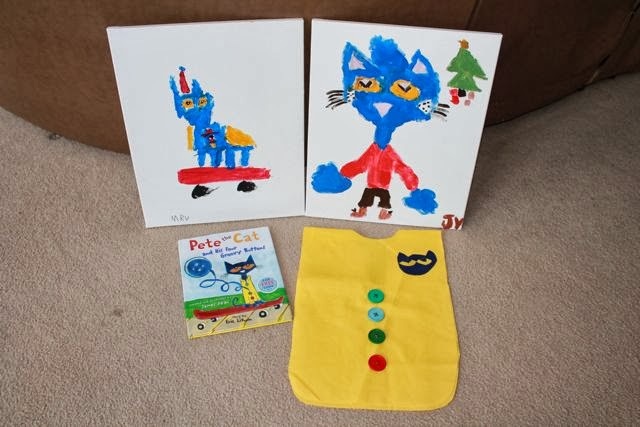 The demand for the paintings of Pete the Cat picked up, and it helped him become a well-known local artist. This led him to self-publish a book of his Pete paintings, The Misadventures of Pete the Cat in 2006. Then, while in the car, a pedestrian got Dean's attention and told him that he recorded a song for him about Pete the Cat. That pedestrian was Eric Litwin and later they self-published a book featuring James Dean's Pete the Cat and Eric Litwin's song and words about how much Pete loved his white shoes. 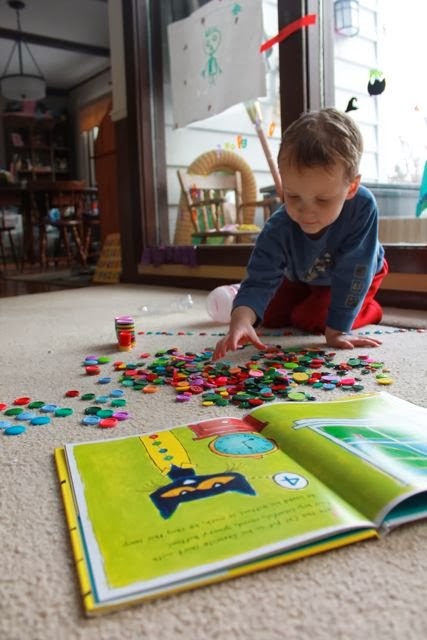 They sold 7,000 copies of the book and caught the attention of HarperCollins which later published Pete the Cat: I Love My White Shoes in 2008. According to a recent article by 10OnYoursideWavy.com the Pete the Cat series has sold over 3.5 million copies. This past summer, I was lucky to meet James Dean. He truly is an inspiring man. I told him who I was, what I do, and asked, "When is your birthday?" I am so thankful that he shared! My family had such a fun week celebrating! I envisioned painting with my family as the perfect way to celebrate James Dean's birthday, but exactly how the experience would unfold was still a mystery at the beginning of the week. "I'm really just a painter, " said James Dean during his keynote speech at the Mazza Museum Summer Conference where he was overcome with emotion as he spoke to a room full of teachers, librarians, and children's book enthusiasts. 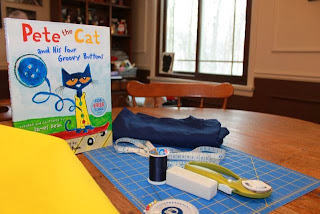 My two youngest children and I spent a morning reading a stack of Pete the Cat books including Pete the Cat: The Wheels on the Bus and Pete the Cat and his Four Groovy Buttons. 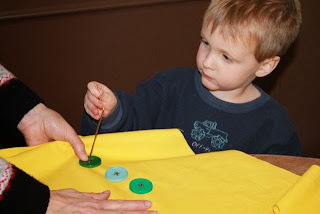 We were singing along with Pete, "My buttons, My Buttons" and I stopped and stared at Pete's yellow shirt with four groovy buttons. I thought it looked a lot like an artist's smock. 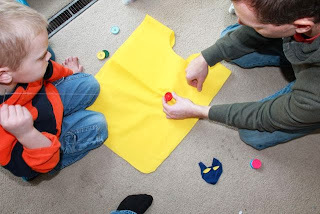 That afternoon my little ones and I headed to the craft store to buy yellow fabric and a bunch of groovy buttons. We bought more than just a few groovy buttons! We bought two big packs because they were buy one get one free! My son and I sorted and stacked the buttons. We even had a button parade. The next step of the project had to wait for the weekend. We needed Mom's help! 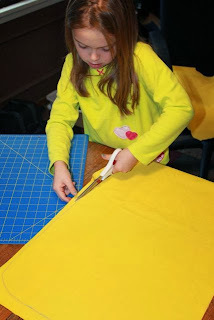 We decided to make a simple one piece artist's smock. This would allow my children to participate in each step of the process. We used an old plastic smock that we had as a template. 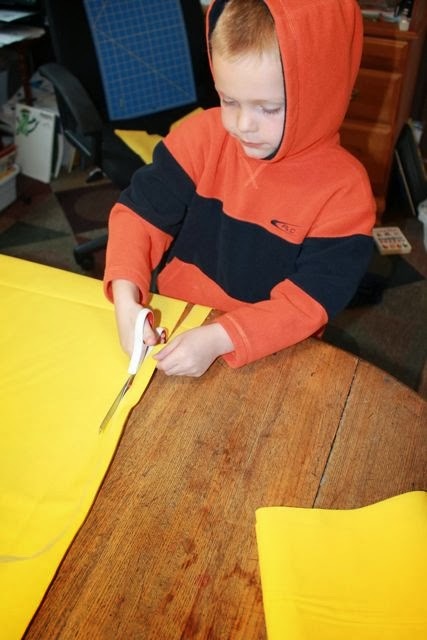 The smock we made for my three year old son was 39" long x 14" wide with a hold cut like the one above (6" x 1" slit tapered into a 4" x 5.5" circle). We traced the old art smock with a piece of chalk onto the new yellow fabric. My children cut on the line with Mom's special fabric scissors! 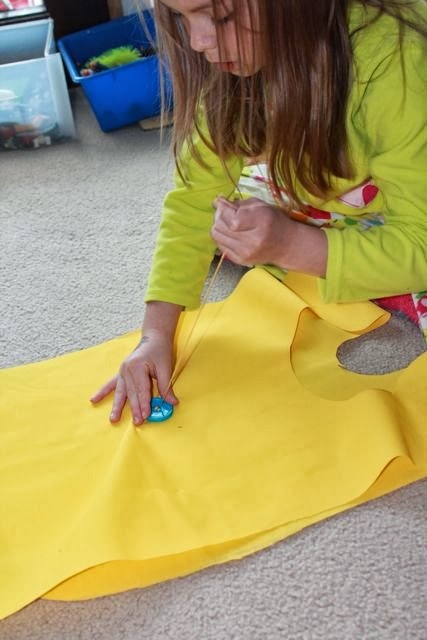 They drew the face of Pete the Cat on dark blue fabric with chalk and then cut it out. 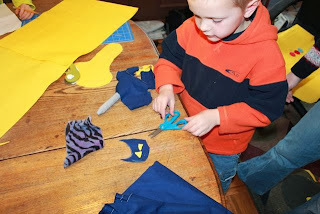 My youngest son chose to draw his Pete the Cat face on paper and then he traced it on the fabric. Both worked well. Eyes were made from scraps of the yellow fabric. We attached the eyes using Res-Q double-sided adhesive tape. 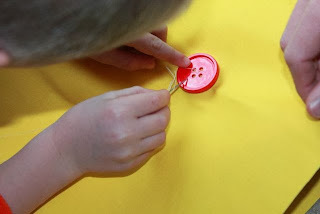 Next, we sewed on the four groovy buttons. I was so proud of my oldest daughter for sewing on her four groovy buttons by herself. When she was finished she said, "I can thank Gail for that!" (Gail, I hope you are reading this.) Gail was our next-door neighbor at our old house. 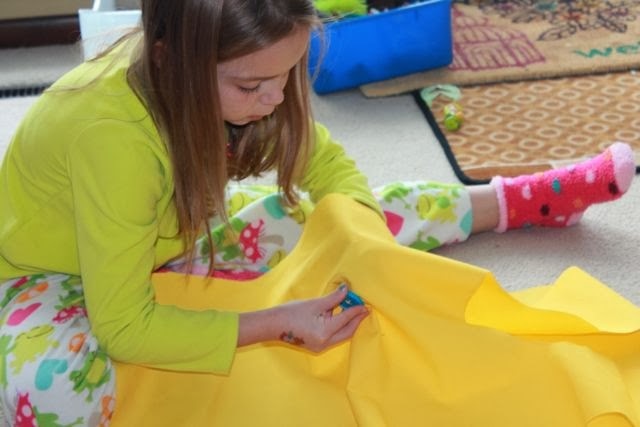 She spent many afternoons with my daughter doing crafts and sewing! We miss you so much, Gail! Even our little guy wanted to try sewing buttons! We once again we used the Res-q Tape to adhere the Pete the Cat faces to the fabric. 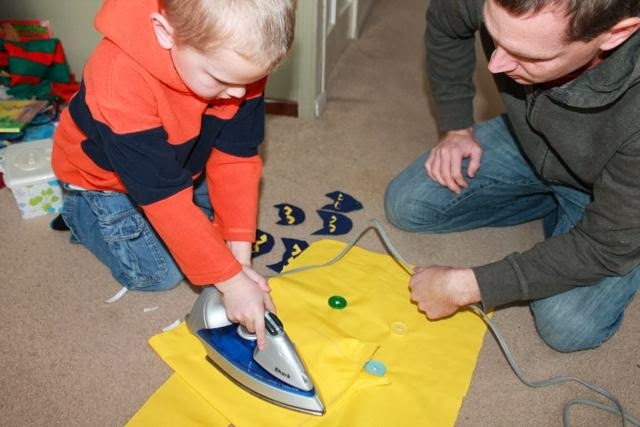 We used an iron to set the adhesive. The directions didn't call for this step, but the woman who helped us at the craft store recommended it. 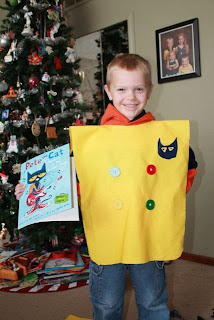 A finished Pete the Cat art smock! On this day we did not do any additional sewing. In the future, we may add ties around the waist and run the edges through the sewing machine to prevent fraying. We took a break for lunch and to enjoy a visit from Grandma. Then later in the afternoon, my son said, "Can we paint now?" 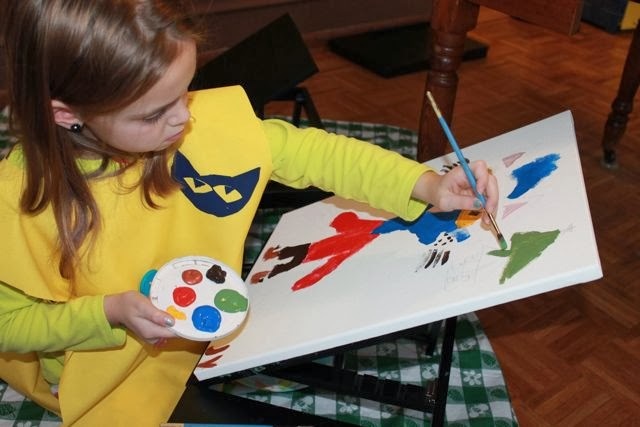 They wanted to paint their own Pete the Cats. 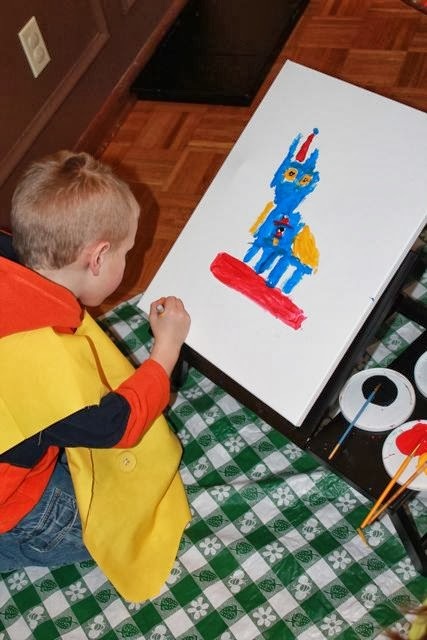 First, they used pastels and colored pencils to sketch out their Pete the Cat on the canvas. 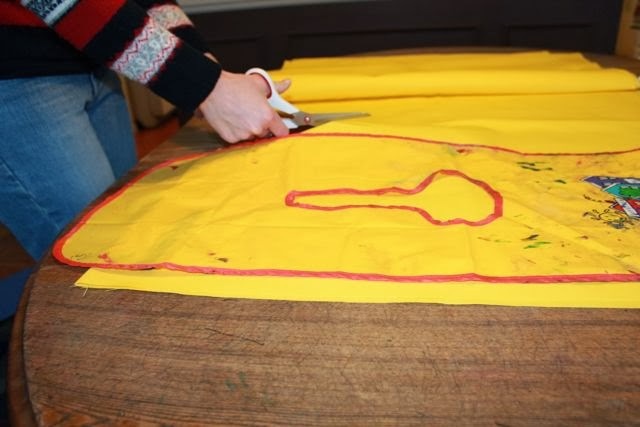 This allowed them to plan out their painting and if they made a mistake they could just paint over it. 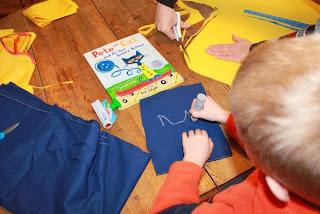 The Pete the Cat art smock looks good! 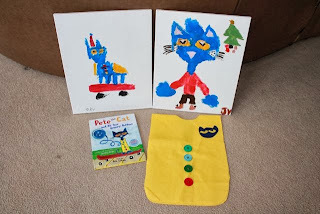 My son painted Pete the Cat on a skateboard with a tiny Santa hat and a yellow shirt with four groovy buttons. My daughter painted Pete the Cat in front of a Christmas tree. I can't help but be thankful after completing this blog post. Life seems to be getting crazier and busier with each passing day, but with the help of my wife and the enthusiasm of my children we had a very positive reading experience. In the words of Pete the Cat, "It's all good!" 5. Pete the Cat Video - Two Girls Singing!